Richard Buchbinder travels far and wide to capture his beautiful photographic landscapes. Much like any good real estate agent would tell you, a key to ingredient to success is location, location, location. Richard holds workshops on various locations to share his knowledge what it takes to get that perfect shot. 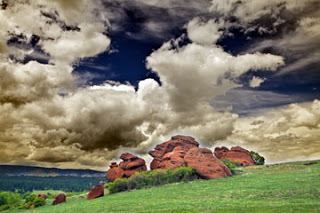 His next workshop is at the Sandstone American Ranch in Larkspur, Colorado. Our Display Graphics Division recently printed the image seen here that was taken at the Sandstone Ranch. For more information about Richard’s work or to sign up for the workshop, please visit his site. The Sandstone American Ranch is a 2000 acre working cattle ranch located 35 miles south of Denver, a short distance from Interstate 25. This setting provides the opportunity for creating exquisite photographs of green mountain grasslands, Ponderosa Pines, streams, ponds and red rock formations. Since this is a working ranch, we will also have the chance to shoot barns, wagons, stables and all of the accoutrements of ranch life. Shooting on the ranch will include cattle and horses, as well as possible encounters with deer and elk. Our time at the ranch has been chosen to take advantage of the beautiful Colorado autumn. Richard will be in the field to work with you during the group shoots, and you will also have time to roam, explore and photograph independently. We will use the morning and afternoon sweet light to imbue our images with the warmth of this magnificent landscape. Time will also be taken for photography discussions, as well as image review and presentations. On Saturday evening we will enjoy a cookout on the ranch, complete with open fire and night photography opportunities.